Brisbane will soon be home to a casino resort and an improved public space after a majority Australian collective, Destination Brisbane Consortium, won the Queensland casino bid. The last Queensland casino license has been a hot ticket for many casino operators. However, opposition from Queensland officials made it near impossible to obtain in 2017. The proposal includes developing 27.3 hectares of land near the Brisbane River, of which 15.3 hectares will be ‘reclaimed’ from the river. This will be the largest private development in the state, according to ArchitectureAU. Destination Brisbane Consortium has revealed that the project will include new and existing buildings, though there are a few buildings set to be demolished. Eight heritage-listed buildings will be retained during the expansion of the area. Key approval from Economic Development Queensland has been awarded to the Destination Brisbane Consortium this month. The collective includes two long-standing international casino operators, Far East Consortium and Chow Tai Fook Enterprises. However, the majority shareholder is Australia’s Star Entertainment, with a 50% stake in the project. Star Entertainment owns and operates some of Australia’s most popular casino resorts. So, they are uniquely qualified to improve the proposed area. The new casino resort is expected to develop public open spaces and a residential area within their plans. 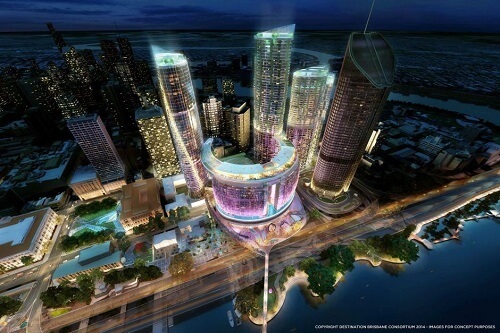 This is likely the reason why other Queensland casino proposals were rejected. After all, the Destination Brisbane project will be improving Queen’s Wharf, as opposed to removing public space. Other projects in Queensland cities were scrapped in 2017, after facing opposition from lawmakers and residents. Two proposed developments in the Sunshine and Gold Coasts were shot down by Liberals. What’s more, the Queensland Premier was also against these projects. However, it would seem that the new Destination Brisbane might just be what Queensland needs to move forward. Of course, the benefits of the Brisbane plan include raising tourist spending and visits, which will improve tax revenues. More so, it will give residents more public space and entertainment options. Additionally, the AU$3 billion project will include over 50 food and beverage facilities, retail spaces and more for tourists and residents. Keep up to date with this project at Pokies.com.